A simple set of specific things makes the difference between good and great content. Having that list of specific things in front of you will make it easy to include them all. That’s what you have now. 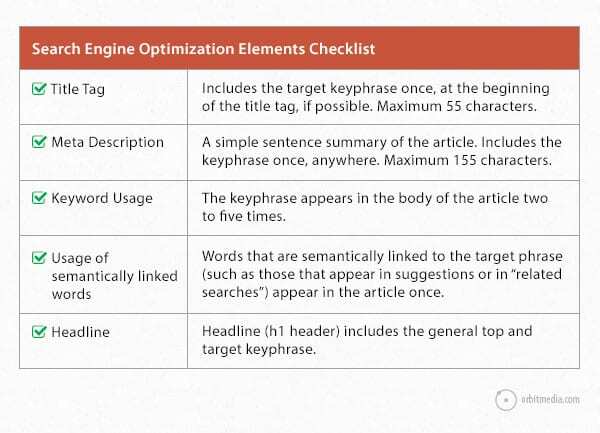 A complete checklist of items to include in a great piece of content. So before you push the publish button, go through this list and make sure you’ve included everything. If you leave something off, do it deliberately. Note: Each of these elements is organized into categories: search optimization, human psychology and media. But of course, there is overlap. The following elements all indicate the relevance of the article. They are key places to use target phrases and increase the likelihood that the content will rank. It’s the text at the top of the browser, in the tab above the address bar, for every page you’ve ever visited. In the code, it’s whatever text is inside the <title> tags. 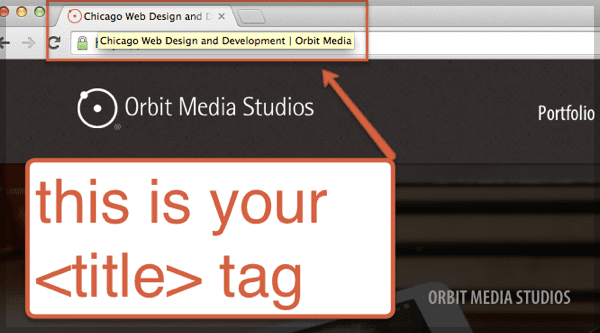 Title tags are the single most important element for SEO. Not only are they a powerful indication of relevance, but typically the title is the link on a search results page. If it’s too long, it gets truncated. 55 characters is the limit. Be brief. Use the target keyphrase once in the title. If possible, use it near the beginning of the title. The prominence of the keyphrase (in other words, how close to the beginning it appears) is important. It might be tempting to put your business name at the front of the title. Don’t. Search engine marketers have a saying: “brand last.” Start with your keyphrase, end with your business name. Remember, your first goal is to help people. Promoting yourself comes second. Although Meta Keywords are totally useless, the Meta Description remains important. It doesn’t appear in the content of the page, but it’s highly visible in search results. Below each link in a search results page is a “snippet” of text. In Google, this snippet is either an excerpt from the body text or more often, the meta description. So make it good. Make your meta description a single sentence, plain English summary of the content of the page. Use your target keyphrase at least once, but not more than twice. Limit the number of characters to 155 to be sure that it will fit within the snippet without getting truncated. We recommend including the target keyphrase in the body of the article at least twice, but not more than five times. Whenever appropriate, use the words of the target phrase together as a “bonded” phrase. This should come naturally if the phrase is relevant to the topic. During editing, go back to make sure it’s used, but not overused. WARNING! Don’t overdo it on the keywords. If you compromise your writing so much that it’s obvious to a reader, you’re guilty of “keyword stuffing.” Using the phrase repeatedly in unnatural ways is bad for readers and bad for rankings. This is obvious to Google, and there’s a chance that you’ll be penalized. Beyond the specific target phrase, use words that are semantically linked to the phrase. Spread out your meaning by using the words that are closely related to your keyphrase. Indicating relevance for the more general topic is good for search rankings. Any great page on your topic would certainly include the closely related words and phrases, right? For example, if you’re writing an article explaining how to design website footers, you may target the phrase “website footer design.” To indicate relevance for the general topic, include semantically linked words in your article, such as copyright, sitemap, navigation, ideas and usability. The headline should be formatted using the <h1> header tag. Use the target keyphrase once, indicating relevance to search engines and stating the general topic to headers. Beyond this, the headline should be written for readers. 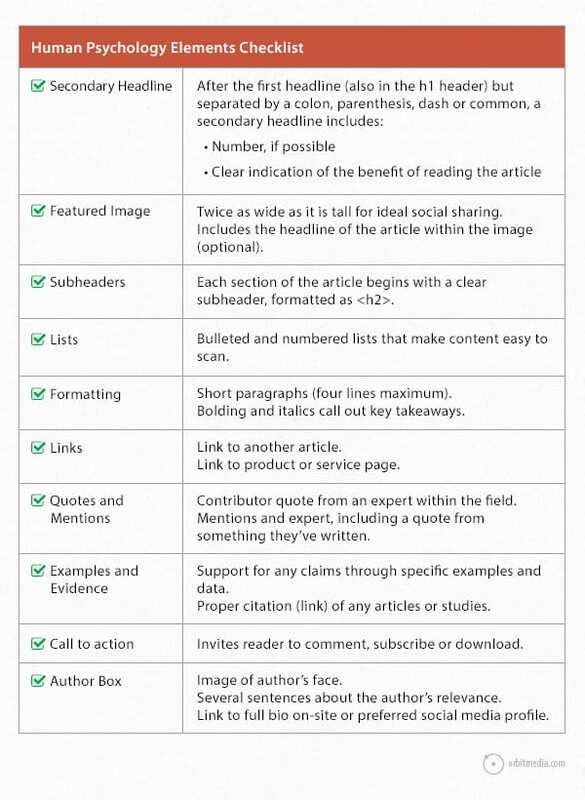 The following elements help align the article with human psychology and increase the likelihood that the article will be clicked, read and shared. A great headline stops the reader in their tracks. Adding a dash, colon or parentheses lets you add a second headline, giving you a better chance at this. A study by The Guardian found that headlines with dashes and colons had 9% higher click rates (source). Articles with images are more likely to be shared and clicked in social media. Content with images is much more visually prominent in social streams. Images also make your message more memorable, thanks to the pictorial superiority effect. Never publish an article without an image. The featured image at the top of the article is most likely to appear in social streams if the article is shared. Most social media sites show a rectangular area of the image, which is roughly twice as wide as it is tall. The main subject of the image is within the center vertically, rather than near the top or bottom. 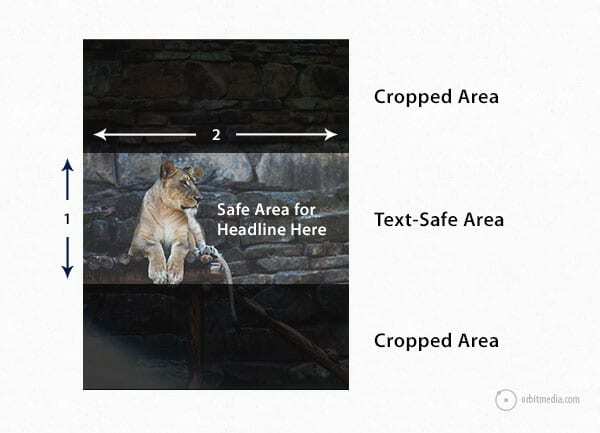 Also, adding the headline of the article (or a version of it) into the image itself makes the image more meaningful, increasing the chance that it will get clicked when shared in social media. People tend not to read online; we tend to scan. To make your content scannable, add subheaders into the article, breaking up the article into sections. These serve as mini-headlines for subsequent paragraphs, keeping visitors moving through your content. These subheads should be formatting using <h2> or <h3> tags, not just bolding. Lists give you a natural reason to use numbered headlines, telling readers that the article will be formatted for easy scanning. Lists articles are successful because we’re busy. They align with our psychology. Don’t hit your visitors will a wall of text. Format your content so it’s accessible and engaging to busy visitors. No paragraph should be longer than four lines maximum. Use very short paragraphs of one sentence or even one word to add emphasis. Excellent ways to add emphasis and make content more easily scanned, but don’t overdo it. Readers are people. Write as if you’re writing for one, specific person. From you, to her. Your site is the mousetrap, your content is the cheese. But if you don’t help make those connections between the cheese and the trap, you catch fewer mice. There is a powerful SEO benefit here. Links between pages helps the authority flow between pages on your site, although these links have far lower impact on rankings than links from other websites. Internal links are also is an easy opportunity to use target keywords in anchor text. If optimizing for search means adding keywords, then optimizing for social means adding people. Input from experts add credibility and will make your article more interesting. It’s also more likely to be shared, since people tend to share articles that mention them. Find a quote that supports something you’ve written. Add it to your article, citing and linking to the original. Once the article is live, share it in social media and mention the author of the quote. Or simply send them a message letting them know you quoted them. While writing, reach out to an expert or two (probably someone you’re already building a relationship with) and ask them if they’d like to contribute a few sentences or a paragraph. If they do, add a picture and link if possible. Once it’s live, let them know. Here’s an example from an earlier post. Don’t expect experts to instantly share articles that they’re mentioned in. But most will, giving you a social media boost. If not, it’s still great for your content and great networking. Great writers support their claims with evidence. They add clarity with examples. Here are types of evidence that you can add to your content to make it more compelling. Ideally, there is evidence supporting each point in your article. Similar to quotes, these are all are ways to work other people into your content, and more people means more mentions and possibilities that they will share. 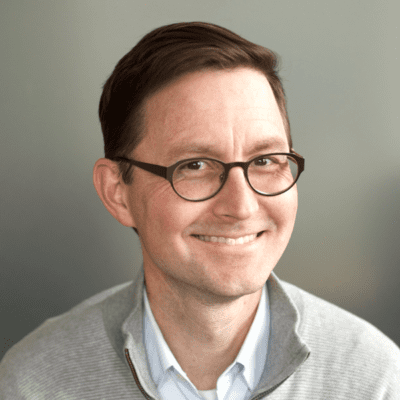 Now that you’ve given your reader a high quality well-structured piece of content, it’s time to ask for something in return. Every great post has a call to action, inviting the visitor to become more engaged with your content or your business. If nothing else, the call to action is simply an invitation to leave a comment. Ask a question that they can answer with a comment, ask for other ideas that would complement the article or even invite the reader to disagree with you. Another call to action is a one sentence pitch to subscribe to the newsletter. The moment they finish reading the post is the high-point of their appreciation. This is when they are most likely to subscribe. For web pages, a call to action may invite the reader to contact. Your goal is to start a conversation about how you can help them even more …if they become a lead. Link to other social media profiles, Twitter, Google+ or LinkedIn. Here are ways to improve quality by adding more compelling media. Of course, you won’t add all of these to every article. But we recommend upgrading your content with something from this list on a regular basis. Subheaders and formatting make articles easier to scan, but adding images throughout the article is an even better way to keep visitors interested. If you add an image every 500 pixels or so (after every three or four paragraphs) then there will be something visual to keep the visitors attention at every scroll depth. In other words, at no point in your article will there be a screen of all text with no images. In our annual blogger survey, we’ve found that more bloggers are adding more images. 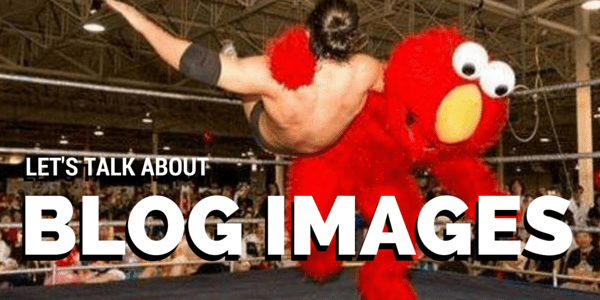 Over 50% of surveyed bloggers are adding multiple images per post. The combination of movement and sound make video the most compelling format for content. Adding video to the top of a post is one of the best ways to get visitors to stay. Getting visitors to stay on your page has indirect SEO benefits. For more info, read about “User Interaction Signals” here. The video thumbnail (default image) should use the same best practices as featured images. Similar to video, audio is a big media upgrade to any post. It’s also easier than you think. Embed the audio player of the file to the page by copying and pasting in the <iframe> code, just as you would a YouTube video. 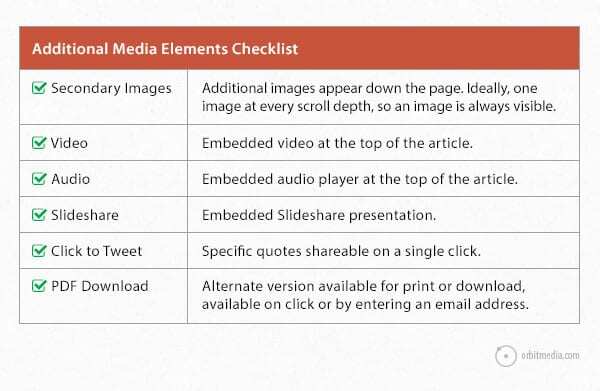 If your article was ever a presentation, it takes only minutes to add it to Slideshare and embed it into the article. But even if it was never a presentation, you can easily add images to PowerPoint, uploading the PowerPoint into Slideshare and embedded it into the post. The easier it is to share, the more likely it will be shared. This is another simple way to optimize your content for social media. Take a short, compelling quote from the article (or use a version of the headline) and write it as a tweet, using the link from the article, along with any hashtags and mentions. Put the tweet into Click to Tweet, then embed it into the article as a link or a little blue bird button. The PDF is really an alternate version of an article, added as a convenience for visitors who may want to download or print it. Large companies doing B2B marketing often add these to white papers or case studies. More recently, the PDF is a common format for the “content upgrade,” available to visitors who enter an email address. This is a cornerstone tactic in marketing automation. Copy is not written. Copy is assembled. These are the words of copywriting legend Eugene Schwartz. They’ve never been more true than today, in the era of content marketing. A great piece of digital content is assembled from many little elements, words, images, tags, media and formatting. Each adds to results of the whole in it’s own way. …That’s it! Did we miss anything? If you have questions or suggestions for things to add to this checklist, please let us know with a comment below. Thanks for pushing out to everyone. This is an awesome resource. @BrendanNoone Glad you liked it, Brendan! This is invaluable. Thanks–looking forward to hearing you talk about it tonight. We do miss out on few steps though! Thanks, Suzanne! I’m glad you liked the Personal Branding Summit conversation. I’m a big fan of Navid! It’s incredibly informative post! 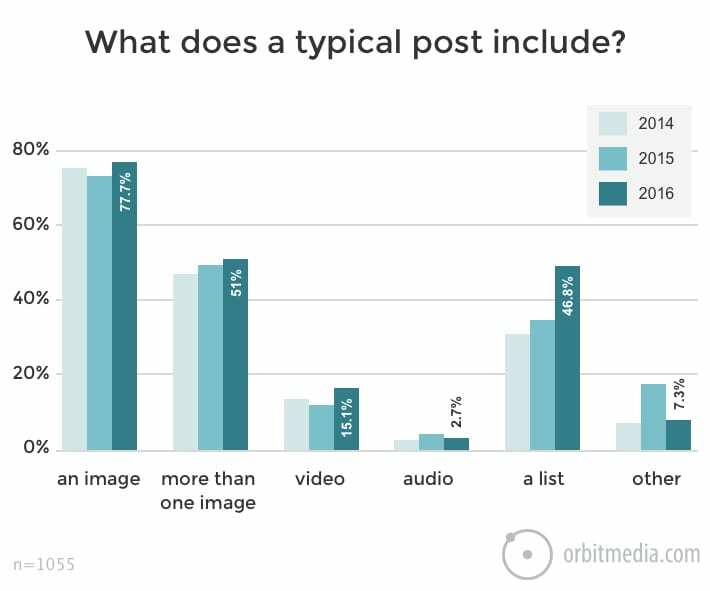 Admittedly, you always have this kind of posts at Orbit Media blog 🙂 Thank you so much for sharing this valuable data! Thanks, Simon. You may have noticed from the dates on the earlier comments, this was an update to a post from a few years ago. So much had changed, we had to refresh it. OK, I made an author box. It was a little tougher than I expected… eventually I found a WordPress plugin called Starbox which works pretty well. Thanks again for another winner. I’m trying to spruce up our manufacturing blog and make it more interesting. I appreciate the tips. Thanks Andy. Your articles are always a source of inspiración. This is a terrific and helpful list. I’ve already printed it out for future.use. Thank you! Looking forward to checking out the rest of your site. How does exactly using external links help your blog? And how many external links in one article are too many? Thanks, G.
fantastic read. I’ve would have added in on SEO requirements subheadings, rich media, and internal/external links. But Competing the entire checklist will have you covered.